In 1955 the Bild Lilli doll was first sold in Germany and is UNMARKED. Later she was exported to several countries, even the USA (have a doll stand with only "Lilli" on them, the German stand says "Bild Lilli"). 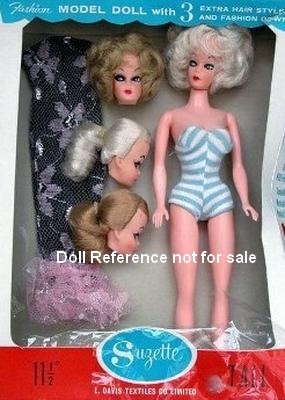 Mattel Barbie was sold in 1959 (USA) and was loosely based on the Bild Lilli doll. British Hong Kong firm named Dura-Fam Ltd. which produced the same 11 1/2" Lilli doll which is found marked "Hong Kong", these dolls are referred to as the Hong Kong Lilli's, and there are other dolls too, see below. Another set of molds were leased to Chang-Pi Su Co. who reduced them to 7 1/2" - 8" and released them as "Cherie" dolls. More blank molds went to Fab-LU (Luften, Ltd.) who sold a doll called Babs, 11 1/2" tall (shown on left), packaged in a clear tube with "Babs", The Teenage Fashion model", Made in the British Crown Colony of Hong Kong, written on front. Sak Industries, Inc. used the mold and sold a doll named Babbie, 11 1/2" tall. Haro-Mate Ltd. an Australian company, sold dolls marked "Hong Kong" and carried the registration number of "British Patent 804566 and U.S. patent 2925684. Most of these dolls come from the 1960s -1964. BRB Miss Teen - 11 1/2" tall, ponytail swirl rooted hair in several colors, came as a baggie, wore a knit striped swimsuit in various colors (generally the stripes will be mis-matched along the front seam, which is a clue that it isn't a Mattel Barbie swimsuit). Debbie in Different Moods - 11 1/2" tall, Hong Kong marked, by Debby Toy, Lilli clone, hollow plastic body straight legs, plastic molded ponytail hair style, came with 3 additional heads; I am happy face, sad or furious. Eegee - sold Lilli look a likes named; Annette, Babette, and Miss Babette, 11 1/2" tall, ponytail hair style came in several colors, can be marked E G on head rim, but some maybe un-marked. They made a rare black Babette ponytail with bangs that preceded Mattel's Julia doll, it has a shorter head and body and starfish like arms. This company was also known as Goldberger Toys. Elite Creations, Inc. had an 11 1/2" doll named Wendy (usually with a swirl pony tail hairstyle) and Bonnie (very similar, slightly different face with a pony tail and bangs) both dolls are marked on the neck: E43. Boyfriend Jim doll and little sister Sandy doll a Skipper clone. Gina Ann Modes doll, 7-8" tall, small Lilli clone, made in Hong Kong. Larami Corp. - made a Bobby (Ken clone) and Janie (Barbie clone) dolls, they are made of very cheap hollow plastic, both have molded hair, she with a molded ponytail and a Lilli type face. Missy - made in Japan, The Teenage Fashion Model, 11 1/2" tall, came in a box with clear cello over the front, much like the Mattel dolls, maker unknown. 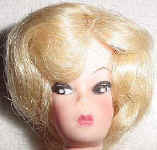 Tina Marie, 11 1/2" tall, Lilli clone head, sold in Woolworth's and similar stores, maker unknown. Marx used the Lilli head mold for an 11 1/2" tall doll called Bonnie, a larger 15" doll called Miss Seventeen "A Beauty Queen", and a 7" doll named Miss Marlene. Bobby & Janie Teen Fashion Shoppe Gift set - Janie doll 11 1/2" Lilli clone with plastic molded hair, came with three additional outfits, by Larami Corporation. Plastic Molded Arts (PMA) made a Debby doll 11 1/2" tall, Lilli like clone, usually with a golden blonde ponytail, hollow plastic body, stationary legs and her arches have twin bumps, came wearing various outfits. Uneeda Wendy doll 11 1/2"
Uneeda made a Wendy, 11 1/2" tall doll, Lilli look a like head and face, bubble-cut or ponytail hairstyle with bangs or swirl, often marked on back of head : U - however, this is a standard stock head and many dolls will have this head mold and the U marking and may not be Wendy or even an Uneeda made doll. (shown on right) 1960s Suzette Fashion Model Doll made by L. Davis Textiles Co. Limited (Davtex) 11 1/2" tall - came as a single doll, or a doll with three extra heads you could inter-change on the body, bubblecut & ponytail hairstyles in various hair colors. Marked on back: Davtex made in Hong Kong. Suzette's boyfriend is a Ken clone doll named Don.